Terrorists arrested smuggling tens of thousands of Euros from Gaza for Hamas terror activity in Judea and Samaria in their shoes. Two terrorists from the Gaza Strip have been arrested for smuggling cash earmarked for Hamas activities in Judea and Samaria - in their shoes. Attar was arrested last week after it was discovered that he was using his transit permit - issued for work purposes - to act as a courier for cash to fund the terrorism activities of Hamas in Judea and Samaria. The money was hidden in specially designed shoes. He was able to complete the transfer several times, with the total sum of money smuggled amounting to tens of thousands of Euros. A Shin Bet investigation found that Attar's family has ties with Hamas, taking part in operations against IDF forces and digging of terror tunnels. Attar's sons have also hosted Hamas meetings in his house. 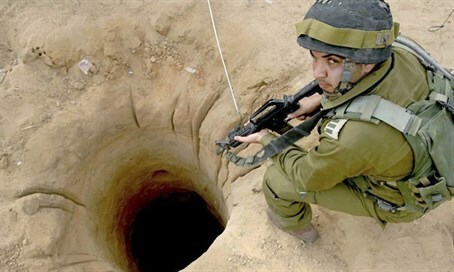 The investigation also turned up information regarding tunnel entrances - some of which are located under residential buildings, housing many innocent civilians who have no ties to terror groups, and mosques - and missile launch pads located near residential buildings, endangering the civilian population. The second terrorist, Sarhan, was arrested last month at the Erez crossing while trying to smuggle 10,000 Euro in his shoes for Hamas in Judea and Samaria. After Sarhan expressed his willingness to cooperate, the Hamas policeman introduced him to other Hamas terrorism operatives who paid him in advance for his services, supplied him with specially fitted shoes in which the money was hidden, and pledged to provide him with support should he be caught. Sarhan had already completed a transfer the day before he was arrested. It became clear during the investigation that he knew that the money was intended for funding Hamas activities. The Shin Bet also discovered that Sarhan has been working as a truck driver for a company that clears away dirt from terror tunnel digging sites run by Hamas and Islamic Jihad. As a result of this work, Sarhan had seen many of the tunnels. He provided Israeli security agencies with much information, including the location of the tunnels, the extent of the progress made in each tunnel, and identity of the terror group behind each tunnel. The Shin Bet have noted that the information obtained in this investigation shows once again how willing Hamas are to make cynical use of Israel's decision to allow people to cross out of the Gaza Strip in order to help them financially. "Hamas uses the bearers of these permits to promote terrorist activity and thus harms the civilian population of Gaza", Shin Bet representatives commented. "Israel allows thousands of Gaza residents to cross into Israeli territory monthly, for humanitarian, medical, and other reasons. The terror groups take advantage of this for illegal purposes including the transfer of funds for terror. This is a serious issue which will be dealt with severely."